This entry was posted in Recipes, Recipes from Adrienne's pantry, Soups and tagged basil, edamame, garlic, leeks, lemon, mint, parmesan, proscuitto, zucchini. Bookmark the permalink. Francesca thanks for your comment. yes indeed we are getting so globalized. 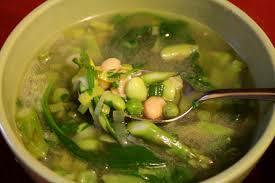 If you can get fresh peas in the spring, try substituting those for the edamame. More European and also very good.